I was back in touch tonight with a 2009 client and finally saw photos of our finished project -- a jersey for the Dirt Divas, Charlotte's Only Women's Mountain Biking Club. I created this logo for the club, assisted with some website graphics, and designed their "new" team jerseys. The team shared some photos of the jersey, modeled by the lovely Divas themselves, via thier facebook page and I can finally share here. 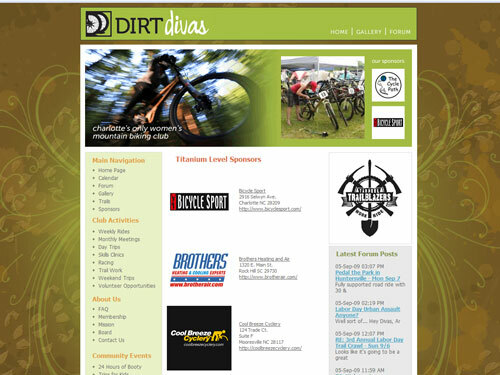 I am proud to have been a part of the great new site for the Dirt Divas, Charlotte's only women's mountain biking club, which went live today! Ben Wilson of Wilson+Taylor called me into help with the background and banner graphics, and I wound up with the privilege of designing their new logo and team jersey (still to come). Check it out - loads of great info on trails in the Charlotte area!